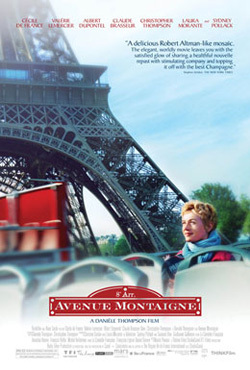 The charming Cecile de France sizzles as a waitress with a dream in the French romantic comedy AVENUE MONTAIGNE. Directed by Danièle Thompson (JET LAG) and written by Thompson and her son, Christopher (who also plays a major role in the film), AVENUE MONTAIGNE takes place on the fashionable Paris street from which the film takes its name. People from a theater, an auction house, and a concert hall gather in and around a central bistro where Jessica (de France) has wiggled her way into a temporary job, having just moved to the big city. At the auction house, Jacques Grumberg (Claude Brasseur) is selling off his lifelong art collection and trying to reconnect with his son, Frédéric (Christopher Thompson). At the concert hall, classical pianist Jean-François Lefort (Albert Dupontel) is tired of being on the road and wants to settle down into a more easygoing lifestyle, much to the consternation of his manager/wife, Valentine (Laura Morante). Meanwhile, at the theater, soap opera star Catherine Versen (Valérie Lemercier) is trying desperately to impress director Brian Sobinski (Sydney Pollack) in order to play Simone de Beauvoir in his next film. And in the middle of it all is wide-eyed Jessica, who has an innocent love of life that captures the heart of just about everyone she comes into contact with. Reminiscent of such fine French films as LOOK AT ME and VA SAVOIR, AVENUE MONTAIGNE features unique, interesting characters, excellent acting, and a lot of fun and fascinating talk about art, music, theater, food, and other cultural delights.